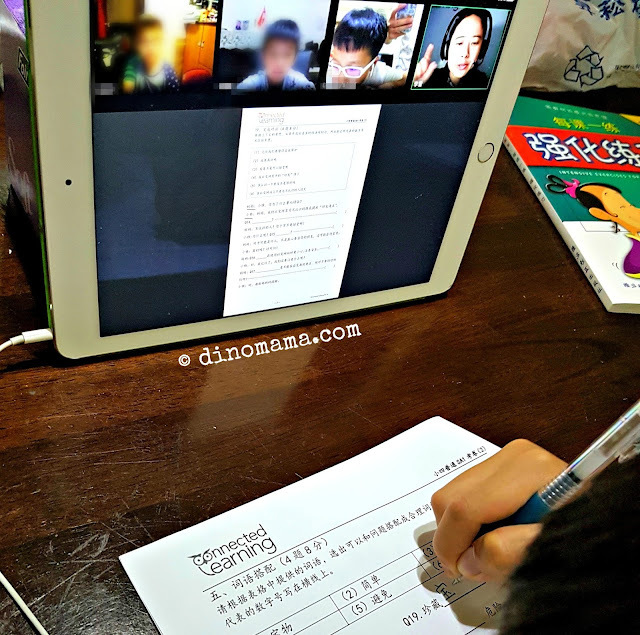 Since I shared an intro post about Connected Learning in March 2016 over here, and posting about DinoBoy's Chinese learning journey with this online tuition centre in my facebook page, I have been receiving questions from many interested parents regarding their course fees and structure. First of all, ensure that you have a working computer, laptop or iPad with camera and of course a stable internet connection. You will need to download a free videoconferencing software and to login with the password to join the class. We are using iPad because our one and only one laptop hooked up in the study room is quite old and not very fast. 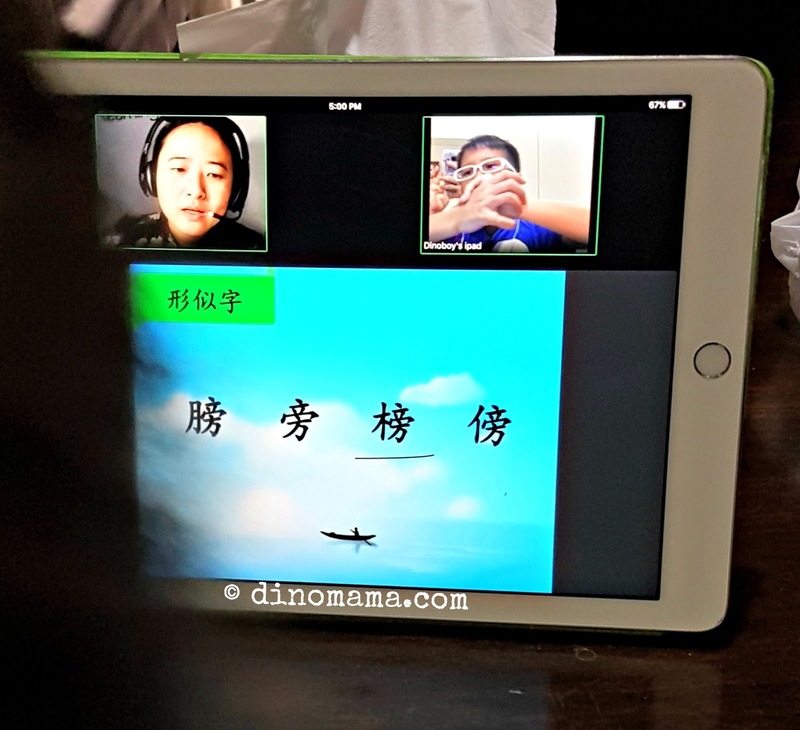 And the thing about wifi connection in the house, we only can get strong connection in the living room where the modem is, with iPad DinoBoy can choose to sit on the dining table or at the living area. Connected Learning tutors are based overseas but the centre will keep them updated on our school syllabus, they can also retrieve important information from our MOE website. They will then prepare their lesson materials accordingly. The tutor will usually teach one or two lesson in advance than the school's lesson progress so as to prepare the kids for it. 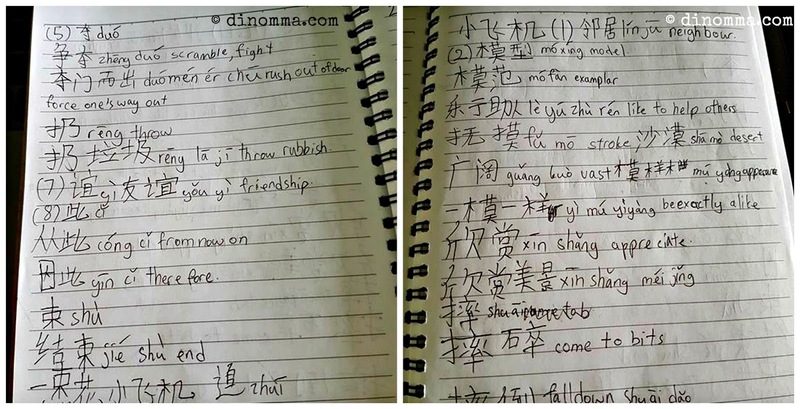 I think this is good for those who are really struggling with the language, by learning the words and understanding the lesson first, the kid will be able to concentrate on other things that the teacher may be teaching instead of feeling stressed up trying to do catch up. I am also glad to know that the tutors are flexible in their teaching too. They will access the kid during lesson and based on the kid's strength and ability to grasp the language they will decide to teach more or less new words or phrases to the kid. This means that their aim is to let the kid learn and understand the textbook lessons and to sort of "push" the kid if he show potential in yearning to learn more. We all know our kids prefer to converse in English, this is not a major problem with the tutors as they understand some basic English or have tools to help them translate English words to Chinese. This is DinoBoy's tuition note book, it contains the words and phrases he learned during the tuition classes. These words may be those found in the school textbook or they could be additional words given by the tutor, in such cases these words will be closely related to the textbook lessons. The pages looked messy because of his hideous handwriting and its a mishmash of every thing, it actually can be broken down to a few categories which the tutor will go through during the lessons. The class usually starts with a lesson in the school textbook where the tutor will request the kids to take turn to read a passage each. Key words will be taught and further to explained with example of the usage of words or phrase. Sometimes she uses photos or pictures to reinforce the teaching and for discussions. For additional words from the tutor, they will be flashed with the hanyupinyin and it's relevant English meaning. Tutor will also show example of usage of words/phrase and encourage the kids to try to do so too. Initially my "jiak kantang" or "eat potato" boy constantly 成了笑柄 or become a laughingstock at almost every lesson when he made funny comments, either by direct translating the English words to Chinese or use the words inappropriately or sentence construction are all messed up. As if Chinese characters are not complex enough, some of them look similar but have totally different meaning or even different pronunciation. The tutor will try to share as many of these similar characters words to the kids, explaining each word and teaching them to differentiate each word by looking at its radical which usually gives a hint of the meaning of it. An example for such is 冰 Ice and 泳 Swim, both look almost the same but of course they are not, kids will probably write an extra stroke on 冰 Ice or confuse it with 泳 Swim thus pronouncing it as 泳 Swim. 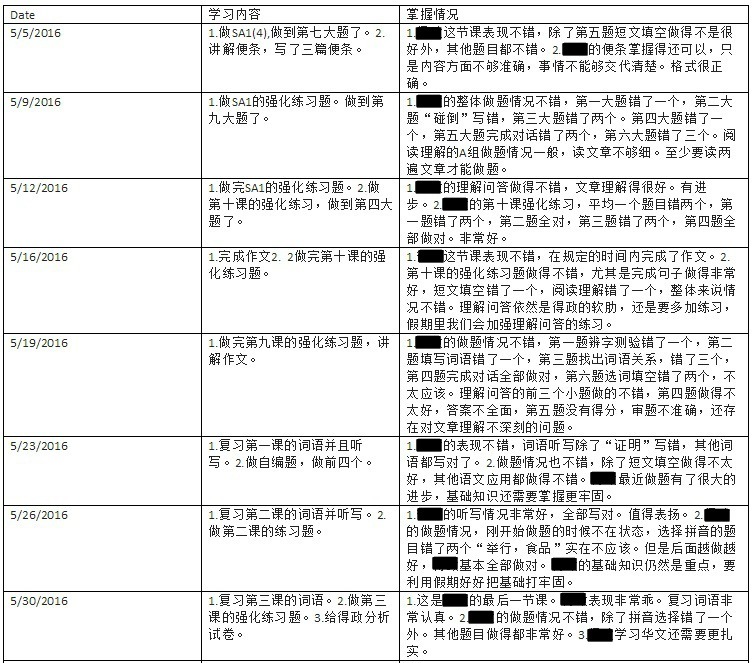 In case you are not aware, the P4 kids are tested on this in exam paper under 辨字测验 section, its MCQ and usually the question will give words that look similar as choice answers to confuse the kid. Kids now are not exposed to Chinese idioms as much as before. Chinese idioms are beautiful, these four characters usually reflect the moral behind the story rather than the story itself or they holds a deeper meaning than the words. 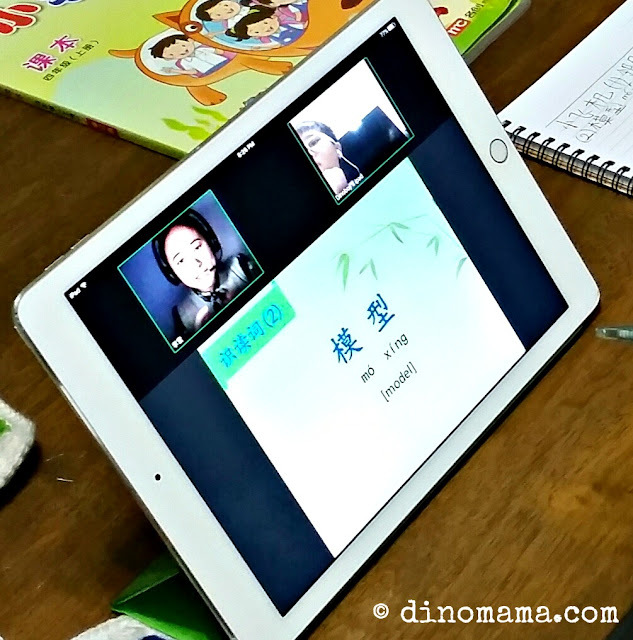 Knowing some Chinese idioms will definitely benefit the kids especially when it comes to composition as they will enhance the feelings towards a situation or person. When used correctly they will probably help the kids to earn extra mark or two in contents. Again, in the exam paper under 词语搭配 section, sometimes Chinese idioms will be used as a question to test the kids. After learning all the above, they must be put to use so that things or sentence make sense right? The tutor will flash a series of questions for the kids to answer, and here is where the friendly competition & bickering comes in. Practice makes perfect but these friendly competition makes remembering the words easier and of course the class more lively. Yes, even though its online tuition there are spelling too which happen I think every other week or once they finish a lesson. The tutor only give words to learn as the purpose is for the kids to revise the words learnt so no long sentences as seen in the school's spelling list. Spelling will be conducted where the words are being read out as usual, for those using computer or laptop, the kid will be able to use a digital writing pad to write out the words and the tutor can see the writing immediately. For DinoBoy since no such device for iPad is available he will write them on the note book and put it in front of the camera to show tutor. As you can see from the photo below, DinoBoy did his corrections too and show it to the tutor. And the marks are given by the tutor verbally, he wrote it down for his own knowledge. In case you wonder, no the boy does not cheat by looking at the words before writing them down. It is not because I am around (95% of the time I am not, I'm all too happy to be able to do my own stuffs in peace), he is honest in this area, no cheating because he knows there are no short cuts to learning and it will do him more harm than any good. 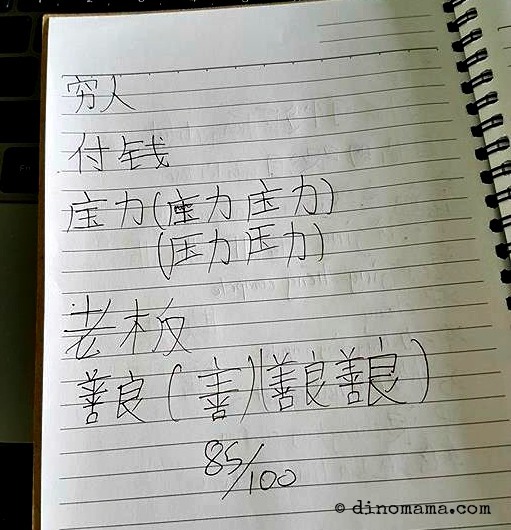 DinoBoy started with Connected Learning in March 2016 till the end of SA1, he only did composition twice with the tutor. Frankly, I have no recollection of what they did as I was away doing my own stuffs *opps* However, by looking at the photos I managed to snapped it seems to be taught the same as his school. After he's done I will take a photo of it and emailed to the tutor for marking. During his time with Connected Learning, composition was done once every one or one and a half month, but I understand that they will be doing it once a month since it is an area where most of the kids are weak in. Since this is an online tuition, there are rarely any homework as the tutor will try to finish the work given out during the lesson. I remember there was a couple of time DinoBoy's tutor stayed online with him till he finishes the last bit of homework, she even take time to look through and explained to him on his mistakes. Besides learning through flashcards and textbook, they also uses 2 assessment books to reinforce teaching. These assessment books are based on current school syllabus and exam format. Connected Learning also have test paper which is set by the tutor in accordance to our exam paper format and syllabus. The exam papers will be emailed to me and I will have to print them out so that DinoBoy can do it during the class. He will be required to tackle these exam paper as if it is the school's exam. That means the tutor will not give him any help and he will be given the same amount of time as required to finish the paper. This is good as he will learn to pace his writing and time himself on his progress. The tutor will use this opportunity to see what are the areas/section that he takes longer then required to finish and give suggestions or solution so that they can work around the bottleneck and enable him to finish the test paper within the time limit. At the end of the month the tutor will give us a Progress Report where they will point out DinoBoy's weakness and will praise him on the efforts he has put in during the class. With this report I will be able to work on the area of weakness with some other learning materials so that he can improve on it. 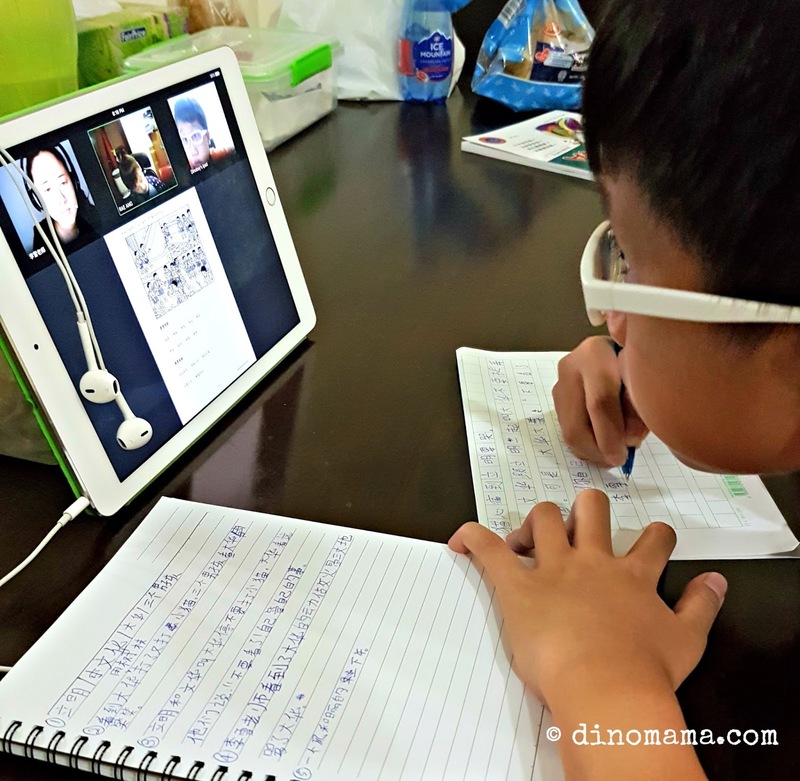 As a full time working mum and the primary caregiver of DinoBoy, going with Connected Learning have made me saved much much more than just only monetary, I saved on the one thing that is precious to all working parents - TIME. Both of us need not rush off from school to have our dinner and off to tuition centre. Instead, I could come home to cook a simple healthy dinner for the family, where we could also eat as a family. DinoBoy even have about 20mins to rest and relax before he start his tuition. Now, who say I can't have the best of ALL world? Ensuring he eats healthy home cooked meals, ample rest time, learning with a stress less mindset in the comfort of our humble cave errm.... I mean home. 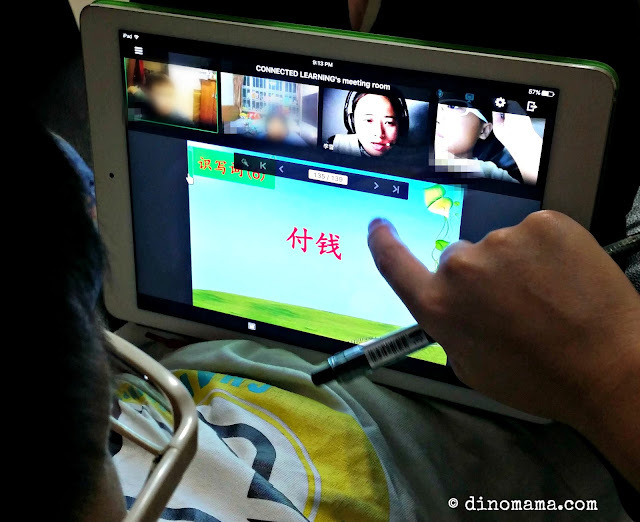 We also noticed that DinoBoy's Chinese language proficiency has improved significantly, he speaks with more confidence, his sentence constructions are better and sound more logical (no more cringing or frowning when I try to understand him), most important of all. his vocab has increased too! If you and your child are constantly struggling with Chinese and still unable to get the grade up to a satisfying level, we strongly suggest that you let your child try out Connected Learning by signing up for their free trial over here. If you are happy with it and wish to continue, quote "DinoMama" and get 10% off for the first month fees when you sign up for their regular classes. 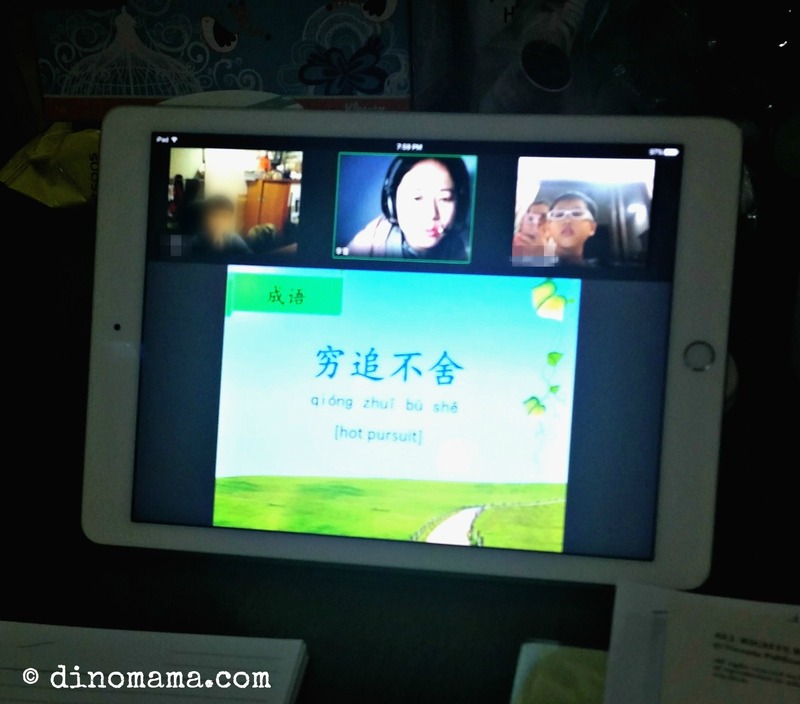 #1 Head over to MummyEd where she share her 6 year old son's P1 Chinese learning with Connected Learning over here. 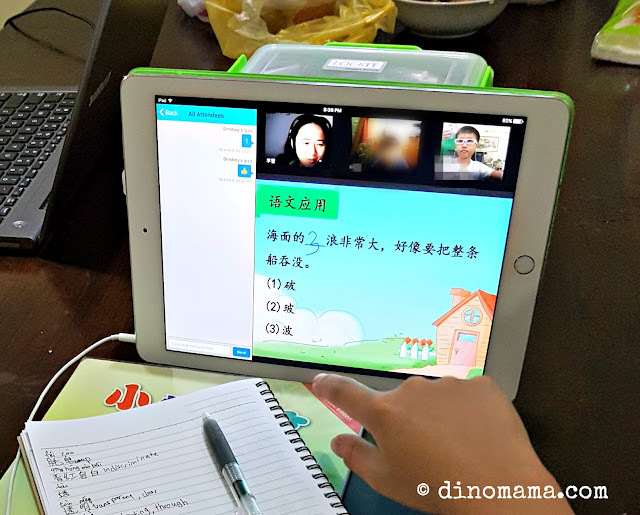 Disclaimer : We were given trial Chinese lessons with Connected Learning Pte Ltd for the purpose of a series of posts. No other compensation was received.